What to write On Writing? That is the question I laboriously pondered as I flip-flopped between editing one of my book’s chapters and thinking about this post. Then it dawned on me, why not choose an issue I’m working on in my edits? If it’s something I’m struggling with, maybe someone else is too? A few months ago, I decided to splurge and get a year long subscription to an awesome editing program called ProWritingAid. It offers help with a variety of writing issues. Options include things such as style, grammar, pacing, readability, consistency, overused words, and more. I tend to think of these as my bitter pills, hard to swallow but good for you. However, there is one that’s more bitter than the others--the dreaded Sticky button! One click and I always find myself in a sticky situation (pun intended). This section highlights something called sticky sentences and glue words. When I first started using this program, I was like “what in the world are sticky sentences and glue words?” As a teacher, I automatically envisioned a kindergartner with a glue stick. Not very helpful for writing. If you know all about this stickiness, great! If not, I’ll try and enlighten you, although I’m still a work in progress on this! I cringe every time I look at this list because I know I use so many of these words! Okay, now we kind of have an idea of what glue words are, so what’s the problem? They detract from the important point of the sentence. 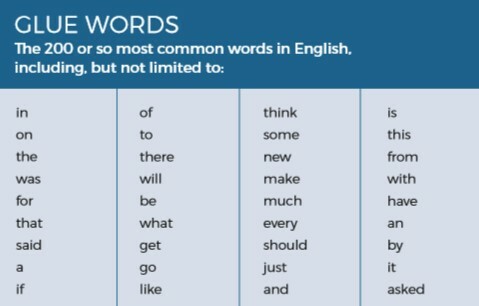 By getting rid of these words, your sentence will be easier to read and understand. As writers, we don’t want to bog down our readers will pointless words. The sharp snap of a branch from the other side of the boulders punctuated the stillness of the forest. This is a sticky sentence with these glue words: the, of, a, from, other, side. The verdict for the sentence...63% glue words. The limit per sentence is less than 40%. It’s hard to see those words until you step back and look for them, and then you see them everywhere! So what can you do? There are two options: delete some glue words without rewriting or rewrite the sentence. Option 1: The sharp snap of a branch punctuated the stillness of the forest. I deleted some prepositional phrases that were honestly not needed anyway. In doing so, I got rid of 6 glue words, and I tightened my writing to increase readability. Option 2: A branch snapped, echoing in the silent forest. I reworded the sentence to avoid the use of glue words. As a writer, it’s up to you how you want to rid your sentences of the glue words. Every sentence will have some glue words, but the trick is to delete the unnecessary ones. What about you? Have you waded into the messiness of sticky sentences and found a way out? Or maybe, like me, this is new and you’re still trying to figure it all out? Thanks for the information! Writing tight is a struggle. One of the best exercises I ever did was go through one of my manuscripts with the goal of cutting out about 5,000 words. Lots of sticky words were deleted. Thank you for helping your readers understand why some sentences are sticky. It's one of our favorite reports! I'm so pleased that you are finding the editing tool helpful.